We stock flexible magnetic sheeting in 12 mil and 30 mil thicknesses and in 25' and 50' rolls. Standard widths are 24", but we can convert to most any width that you may require. We can also laminate any of our films to the magnetic sheeting providing you with a truly custom product. The 12 mil magnetic sheeting is ideal for hobbies, promotional items, refrigerator magnets, advertising specialties and much more. The 30 mil magnetic sheeting is the more traditional product. 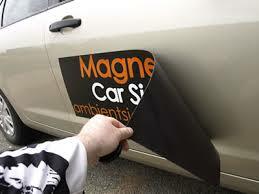 Because of the stronger magnetic bond, it is great for temporary vehicle signage and markings. Flexibility: Can be coiled to a 1" radius without cracking at 68º F.
Machinability: Cuts cleanly and with ease in die, knife, scissor or punch applications. Lead Free Product: Lead-free compounding feature standard on all STYLETECH Magnetic Sheeting products. Magnetization: State of the art multi-pole magnetization method renders 12 poles per inch standard. Splice-free rolls available upon request.